I need a picture of some really Russian looking Dwarves (complete with long beards). The bearskin hat and long coat for a fighter. Please, could one of the artists draw me a Russian Dwarf? Seems most artists with BFRPG ties are involved with other projects. Building a house, comic endeavor, and even art compilations on drivethru rpg. When things settle down, I am sure somebody will take this up... just too interesting of a concept to pass up! Now I really like the bear mounted dwarf. That's awesome. 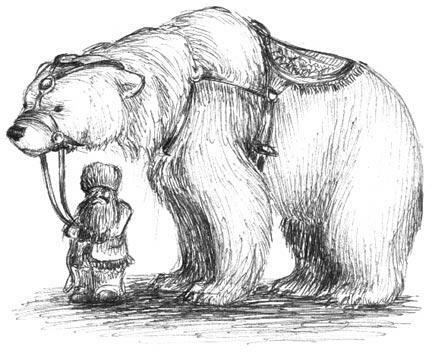 shadowmane wrote: Now I really like the bear mounted dwarf. That's awesome. Yes. Sometimes the writing drives the artists, and sometimes the artwork drives the creative writing. Bears are ideal, going well thematically with things "Russian". I'm still eagerly awaiting your interpretation of all of this Shonuff. shadowmane wrote: I'm still eagerly awaiting your interpretation of all of this Shonuff. Don't suppose its done yet. i'll have it after this weekend. i get my scanner back from the girlfriend. yes you'll have your Hussar Clan Dwarfie on a bear.